Satin America pattern has a contemporary design with a twist. 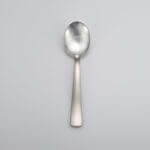 A soft brushed finish on the handle contrasts beautifully against the sheen of the bowl. Featuring slightly larger than traditional “American sizing” pieces, proudly made in the USA. 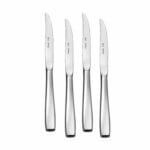 Skillfully crafted with a classic hollow handle knife this quality pattern is ideal for every day use as well as for entertaining. This flatware is beautiful and you can tell is very high quality. Love the modern look with the unique matte finish. 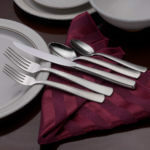 We have been using our new Satin America flatware set for about 3 weeks now. You can tell the quality of this set by the weight of a single piece; yet it isn’t too heavy or awkward to use. It feels balanced in the hand while eating. Yes, you do pay more than you would for something that isn’t manufactured as well, but you will appreciate using it as well as buying from an American company that actually manufactures in America! Recent company at our home during a meal was studying our new flatware closely, then commented on how nice it looked and felt while eating. Says it all right there. Our only negative is our fault – we should have ordered a larger set (we bought a 45-pc), but being retired, was trying to keep the price more affordable for us at the time. Had we not needed new flatware so badly, we should have waited to save up more money and order a larger set. We highly recommend the style we bought “Satin America” and would buy it again. I got these to complete my American Satin set. My wife and I are thrilled and feel fortunate to have this set. We love the look, the feel, and using them. Our company that comes over comments on how they like it. I always support American labor and companies when I can. It’s definitely an investment for my family that will be passed on to the future. Perfect accompaniment to the 20 piece set. This style is by far my favorite as it is not too ostentatious, and works well in any situation. Expensive, but worth every penny. American-made craftsmanship that is built to last. 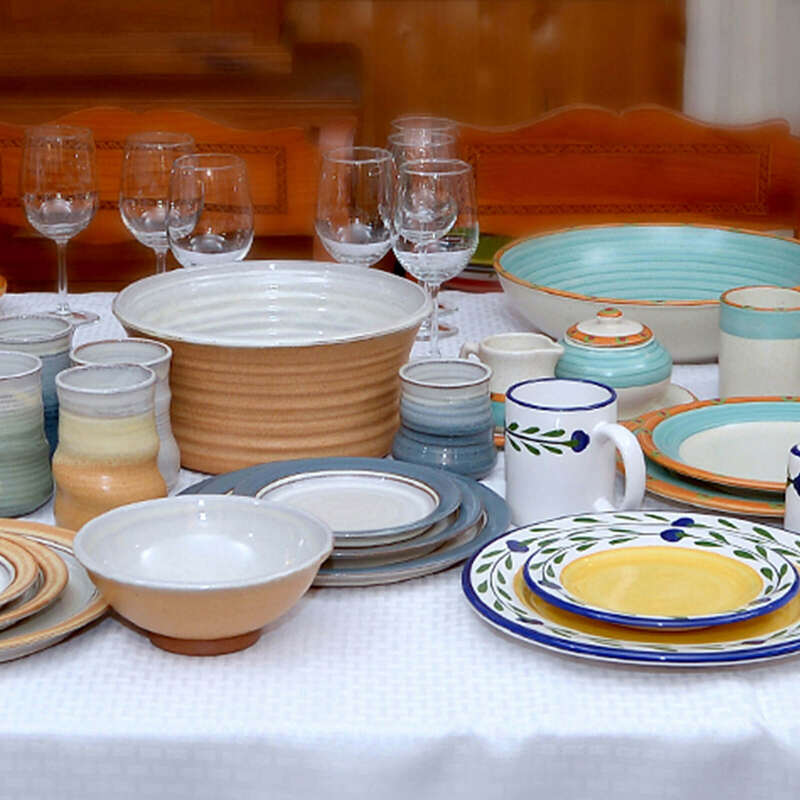 The set is also very well balanced and looks great in any situation. I really love this set! 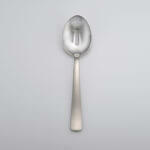 It looks beautiful and I love the size of the spoons- very handy- I replaces a set of WMF and really am glad I did! Love that is made in the USA wouldn’t buy anything else now. They are beautiful and most importantly they are MADE IN AMERICA!!! I’ve received many compliments they are unique and beautiful! 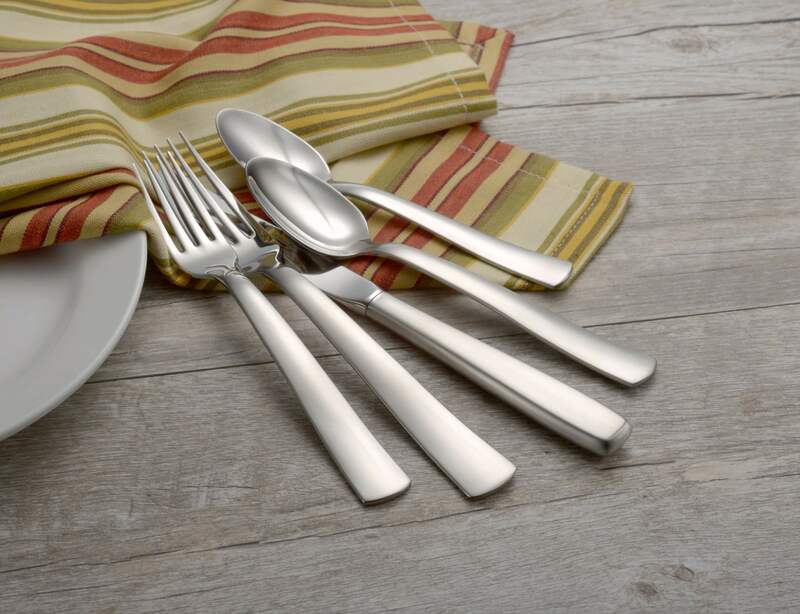 Great quality and great price ,we love our flatware made in the USA! Overall I am happy with our Satin America set. I was a little surprised with the size of some the pieces. 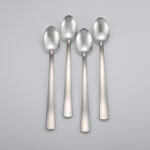 The teaspoons and tablespoons are much smaller and shorter in size than our previous set and overall all pieces are much lighter in weight. Just different from the heavier weight silverware we were accustomed to. They seem to be well balanced though and wash up beautifully. So happy to find a USA made product! 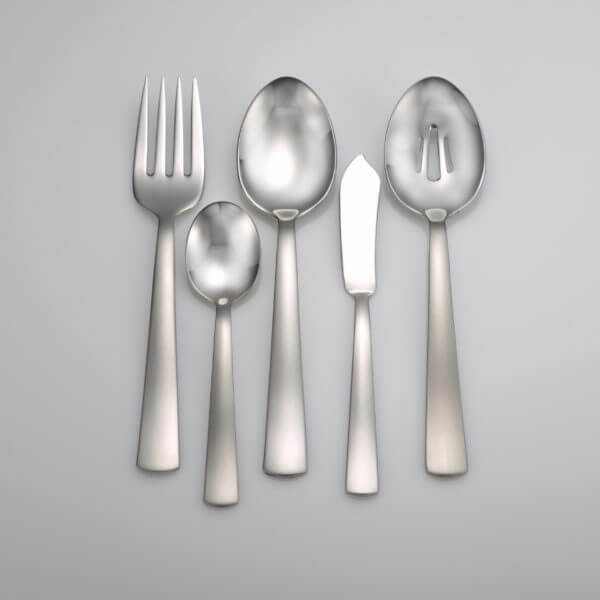 Wanted American made flatware and was very happy to find a company that is still making these products in the U.S. Took advantage of the option to get samples before making a decision and went with the Lexington pattern. Simple but elegant and I am very happy with that choice. Have only had it for a few weeks, but it does beautifully in the dishwasher, comes out spotless. Looks great with any table setting. Kim was very helpful getting the order completed. Hi. you had us at American made!!! Thanks you for the quick shipping “which was feee”, the set is as described and looks great. We love the weight and feel! Already had compliments from some recent dinner guests. We plan on ordering another set for our cabin in the mountains. Thanks for the opportunity to post. I recently purchased your 12 place flatware setting from Amazon. They didn’t have extra serving sets so I ordered them from you direct. I am extremely satisfied with the quality and price of your flatware. Excellent. even though this set is undeniably expensive, I really think it’s worth the money! 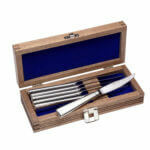 It is an investment, but I love supporting American craftsmanship, and the cutlery is very beautiful! Wow,that’s all we can say!! 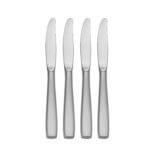 This is the best flatware we have ever bought and this is the only company left still making flatware in the USA. We purchased the Satin America and it is beautiful and was shipped priority mail and we received it in two days!! The customer service is awesome and this flatware won’t rust!! Thanks Liberty and we will order again. I expected quality, and I definitely got it. 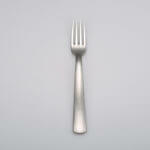 What I feel is an overlooked quality of this flatware is ergonomics. It seems to get lumped in with “quality” or “fit and finish” in general. These are just so comfortable to use. The handles on the forks and spoons are the perfect width. They have a slight concave curve on the back that lets them rest on your finger without much pressure. And they are also very well balanced, like a Japanese Katana. I let go of the fork and it’s almost always perfectly balanced on my middle finger every time. Wonderfully executed design. Great job guys and gals at Liberty! 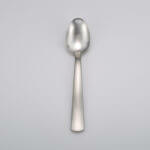 When my husband and I needed to replace our old flatware a few years ago, we were determined to buy American made. We chose the Satin America pattern and have been quite pleased with the design and quality. I recently decided I wanted iced tea/coffee spoons and was delighted to find that they were available in the Satin America pattern. I received them a few weeks ago and again am quite pleased with them. I love this set. It’s well made and beautiful. 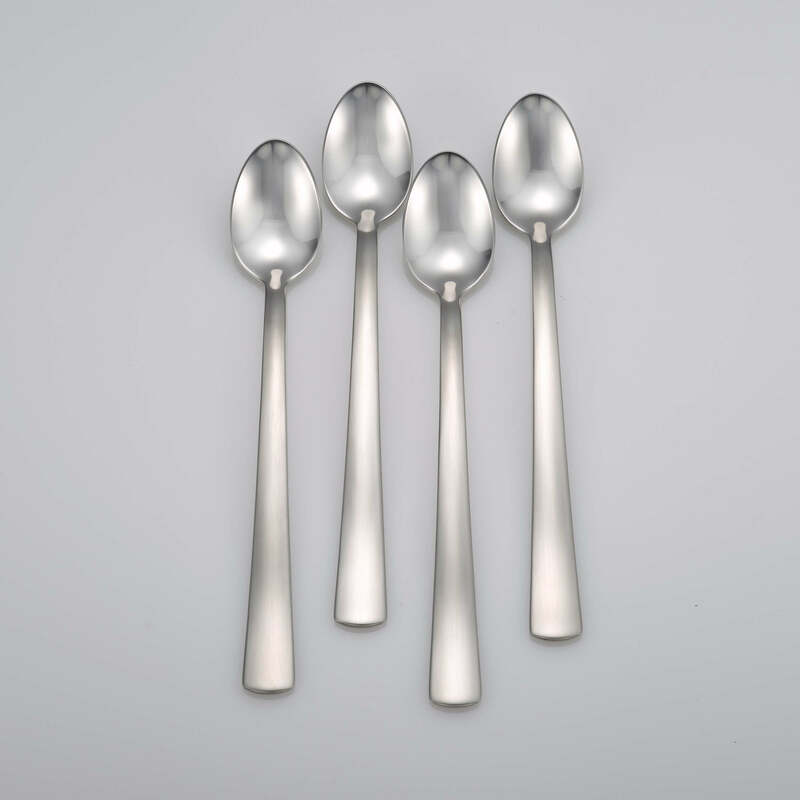 I am now buying this same set for my parents’ anniversary so they don’t have to keep bending back their spoons on their current Korea stainless steel flatware. We love it! Have had several compliments! Purchased Heritage Satin America silverware as a gift. Excellent customer service and packaging with quick delivery. 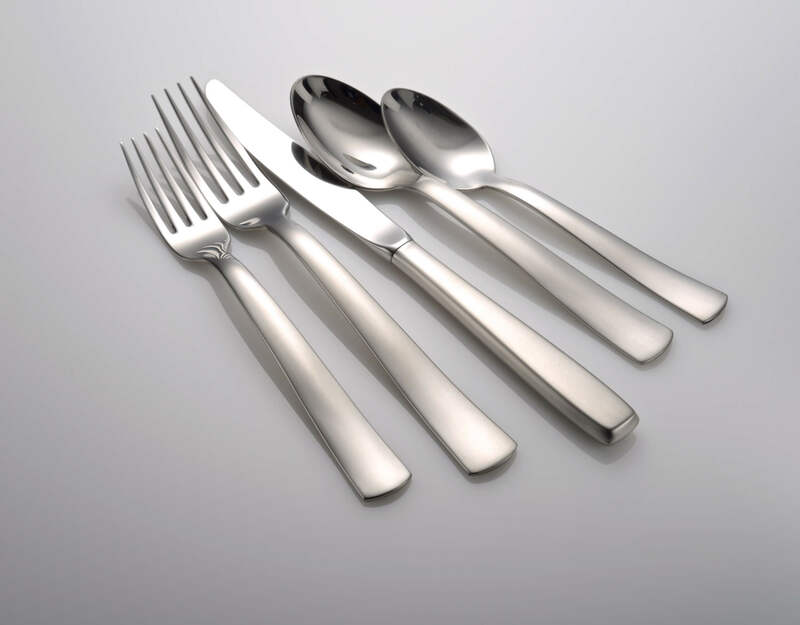 Recipients extremely happy with the silverware design/pattern and quality. 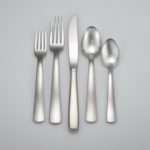 I ordered the hostess set and a couple serving pieces to match my existing Liberty flatware. 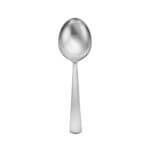 It is a great product and am very happy with the quality of the flatware. I would highly recommend to anyone. AND it is make in the USA! I bought a new set of Satin America flatware to replace the half of my original set lost when I moved. This is the sort of product your kids will fight over when you’re dead. It’s of a quality you don’t see anywhere else and is absolutely worth purchasing for your household or as a gift to people you know. I’ll definitely be returning to Liberty Flatware in the future, for wedding gifts. We recently purchased the Satin America set and couldn’t be happier. The fact it’s made in the US is one of the primary reasons we bought, but the fact it is sturdy and beautifully made is an added bonus. I’ve told many people about Liberty Tabletop and hope others share my enthusiasm for supporting American business. 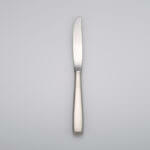 I love the quality and craftsmanship of your flatware. Love the quality of the set. We currently have this set service for 12. Now have service for 16. We are very pleased with the weight, design and craftsmanship. We purchased the flatware as a gift for our daughter-in-law.It is just like a set we purchased for ourselves a couple of years ago. 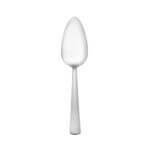 Our daughter-in-law stated it is the best flatware she has ever had. we feel the same way about the set we have. 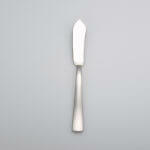 The flatware is beautifully made. I bought a set for my niece and she is very happy with your products. 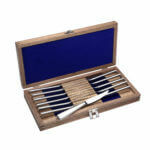 Your flatware sets are great gifts!! 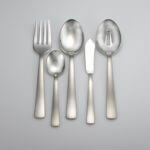 When looking for a new flatware set, I searched for some not made in China and found Liberty made in the USA. I ordered service for 10 and then recently ordered the new serving pieces. 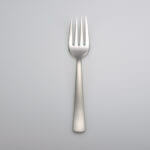 We are extremely happy with the quality and the price of thus stainless flatware and would highly recommend to anyone. 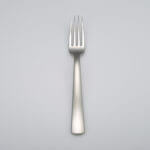 After looking for over two years for good stainless flatware, was delighted to discovered “made in USA” Liberty Tabletop. So glad I waited and settled on Liberty Satin America. It is perfect for my family, entertaining, and every day use. My son and daughter-in-law love it. A little more expensive but well worth the difference. I ordered a set for twelve and liked it so much, ordered another set of twelve as it is so nice to have flatware to go around to all and in the same beautiful pattern is an added plus. Great beauty, quality, weight, balance and workmanship. Had added surprise when just before Christmas I received an Email about a Hostess Set was available now, the pieces to add to my side pieces. So glad I could get American made. Great product. Needed customer service immediately because I had not taken advantage of discount. Customer Service was excellent and responsive. I would recommend the company and their products to everyone. 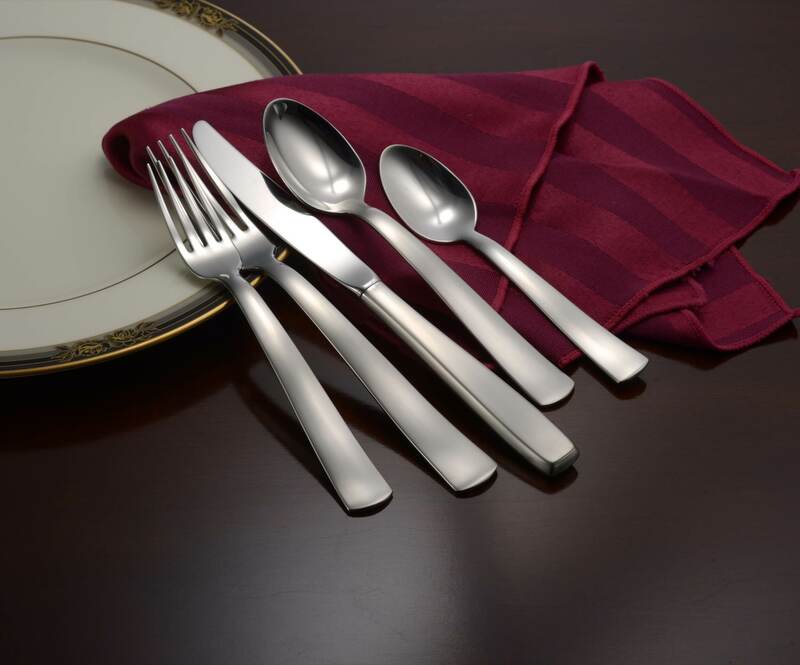 Flatware is not something we buy often, but we will continue to add to this set, and will purchase products again from Liberty as need arises. Love the simple, clean, modern look of the American Satin flatware. 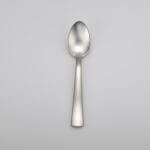 The size of the spoons and forks is perfect. 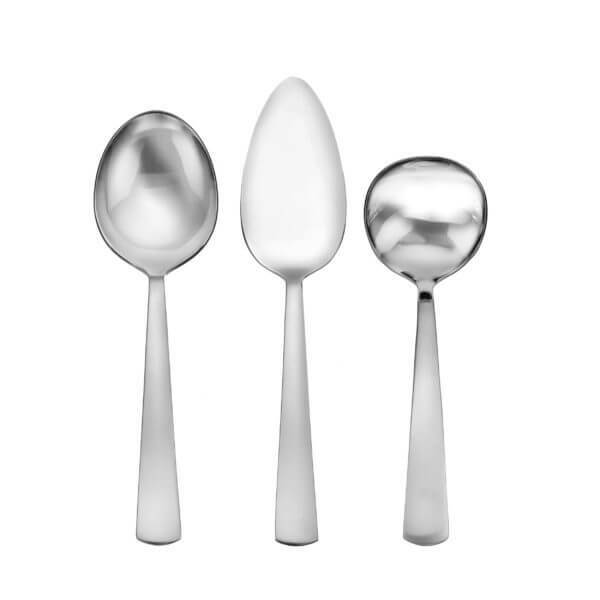 So many modern sets I looked at had huge spoons and forks. So happy that it is an American made product! After looking 2 years for good substantial stainless flatware, I finally settled for Liberty Satin America and so glad I waited. Wanted something made in the USA and am so glad I found Liberty Tabletop. Ordered this months ago for Christmas gift for my son and daughter-in-law but couldn’t wait to put to use right away. We love it, a little more expensive, but well worth the difference. 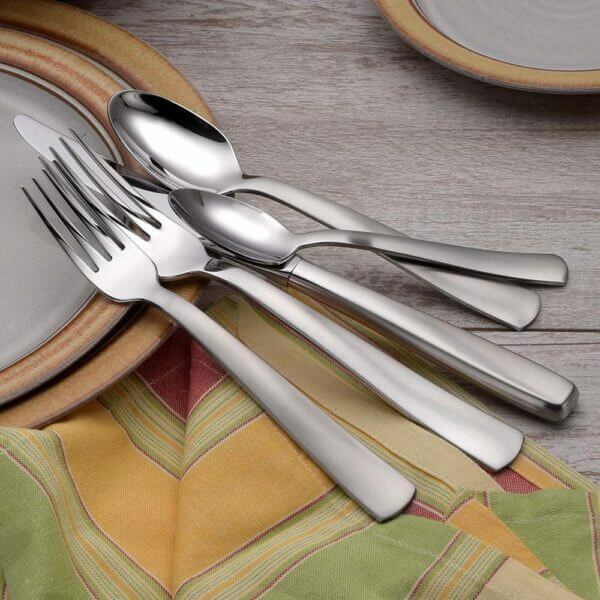 I bought a set for 12 and liked it so much I ordered another set of 12 and it is so nice to have enough flatware to go around to all and in the same beautiful pattern is an added plus. Great beauty, quality, weight and workmanship. Thanks Liberty for putting out such a wonderful product. After receiving a 20% off coupon from that national home goods store, my wife and I decided to replace our ancient silver plate tableware. We went to the local store and saw a pattern we liked from a well known manufacturer. Luckily for us, the store was out of stock and recommended we go online and order. So, I went online, but looked at reviews first. 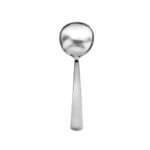 A lot of reviews mentioned receiving incomplete sets; most mentioned rusting problems – from stainless steel!!! So, my wife went online, searching for US made tableware and found Liberty Tabletop. We ordered and the (complete) set arrived very quickly. The set is expensive, about 4 times what we were going to spend at the national chain, but sometimes you get what you pay for. 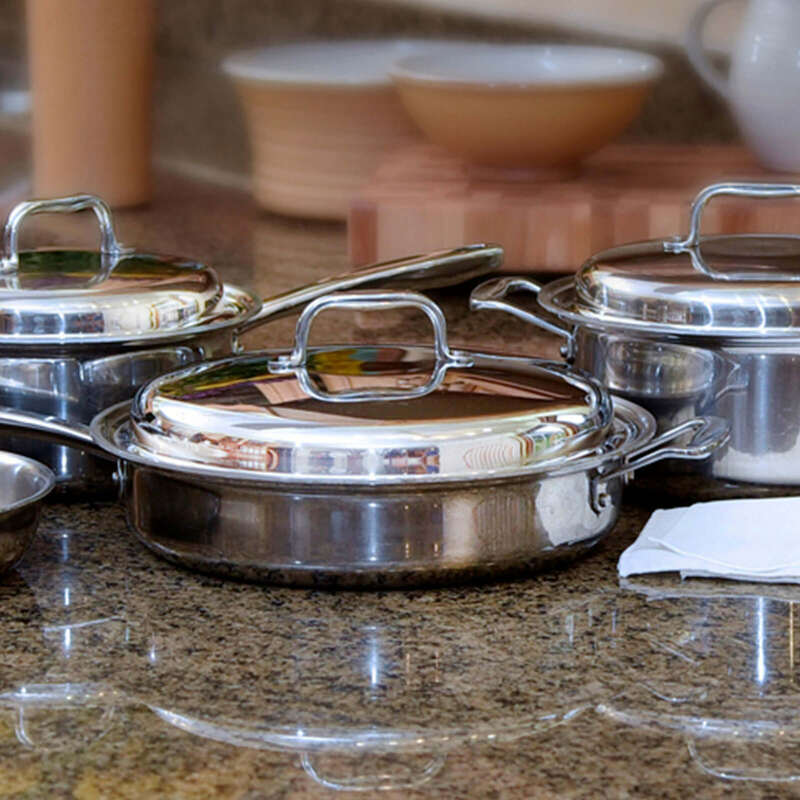 We are extremely happy with our purchase – after a few dishwasher cycles, we have no rusting. There is some spotting, but that is not a manufacturing problem. I like the looks, the feel of the tableware in my hands, and the heft. 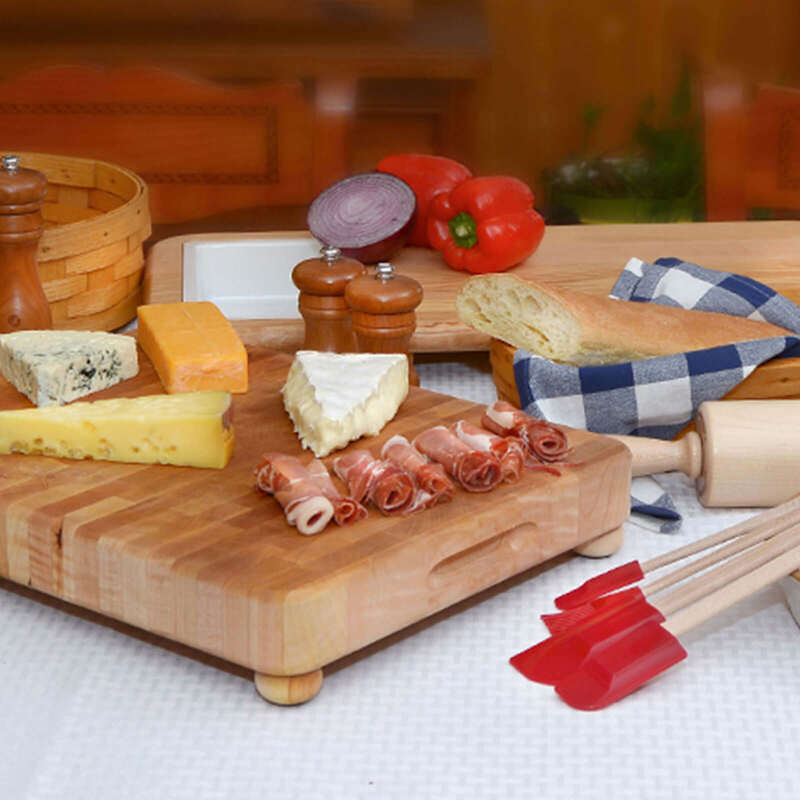 We are recommending Liberty Tabletop to friends and relatives. We needed to replace oure flatware, but I was not going to pay top dollar at Macy”s for something made in another country. I researched the web and found Liberty, Made in USA. I ordered and was not disappointed! The quality and workmanship is amazing. I was so impressed I ordered a set for my Mom as a present. I bought two 20 piece services for 4 and am very pleased. It was a little more expensive than many others but I was impressed by the quality and generous warranty. I immediately gave away my Chinese made service for 12. 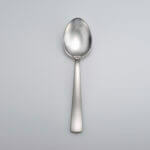 I wish that each service had double the amunt of teaspoons. I”m very happy with this simple, sturdy, attractive flatwear. It has been through the dishwasher numerous times without problem. Also, I was very happy to be able to support U.S. workers. 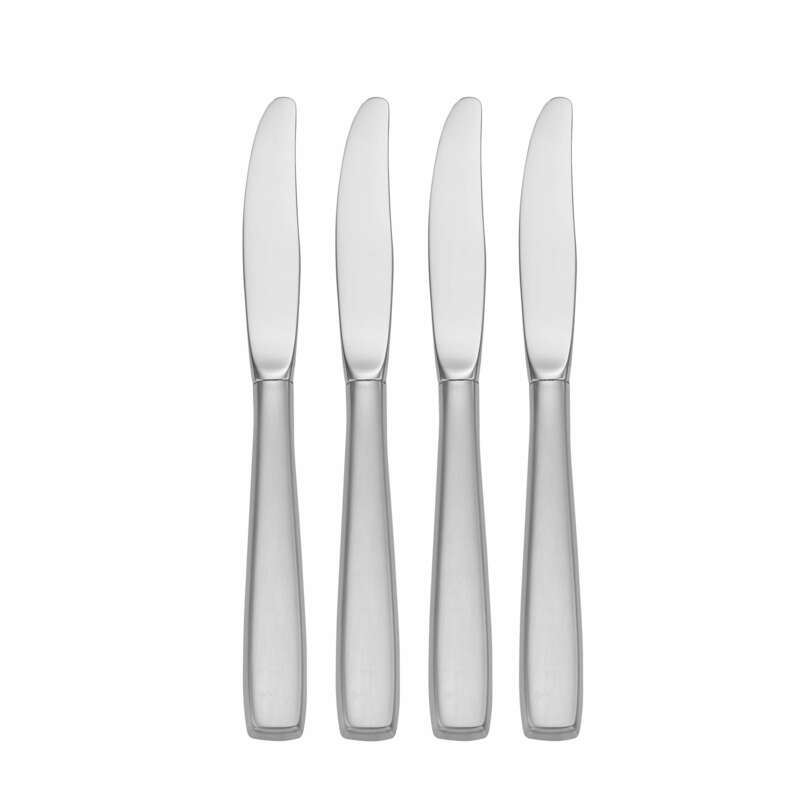 I needed to replace some cheap flimsy flatware and these were perfect. They look great and are nice and substantial. Purchased a set of the Satin America for our children who live across the USA from us, and finally have been able to see it in person. Very impressed with workman ship, weight and balance of all pieces, and value. They love it too. Pictured representation is so accurate. Thank you so much for employing Americans and for allowing Americans the opportunity to purchase quality stainless flatware at a very reasonable price while being produced in the USA. I purchased as a gift for my daughter. She thought they were fantastic especially because they are made in America and liked them on facebook. This set is just gorgeous & very high quality! 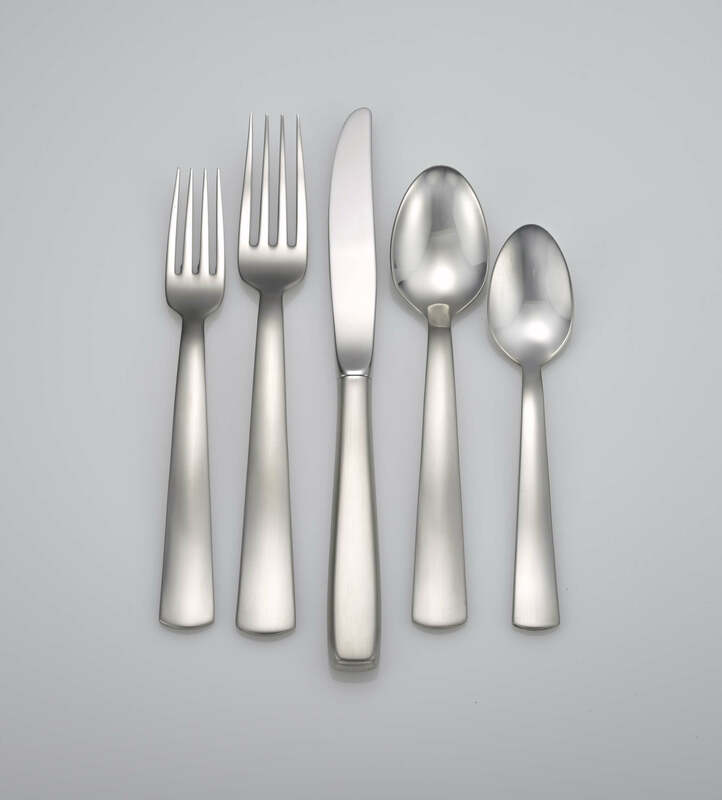 I had to go on line in order to buy a flatware set made in USA. I am honored to buy American! 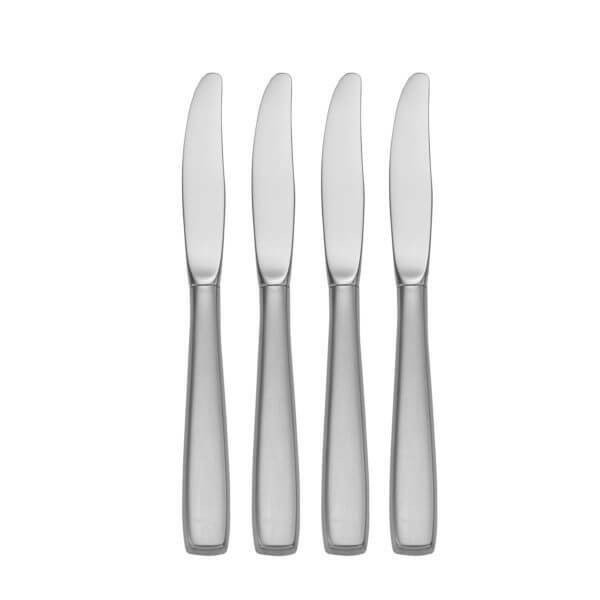 My gf could not believe it when I asked for flatware for Christmas. She started looking online and had me looking at various patterns. My Chinese made “Stainless” had started to rust. LOL. I wanted American made, simple, heavy but nice looking. After looking on the web I found your site and I thought I had found what I wanted. After I got to open my Christmas presents that morning I knew it for sure. This stuff is nice. Thanks OJ and Thanks to the people at Liberty for selling me something nice that I get and want to use every day. We are thrilled with our purchase. 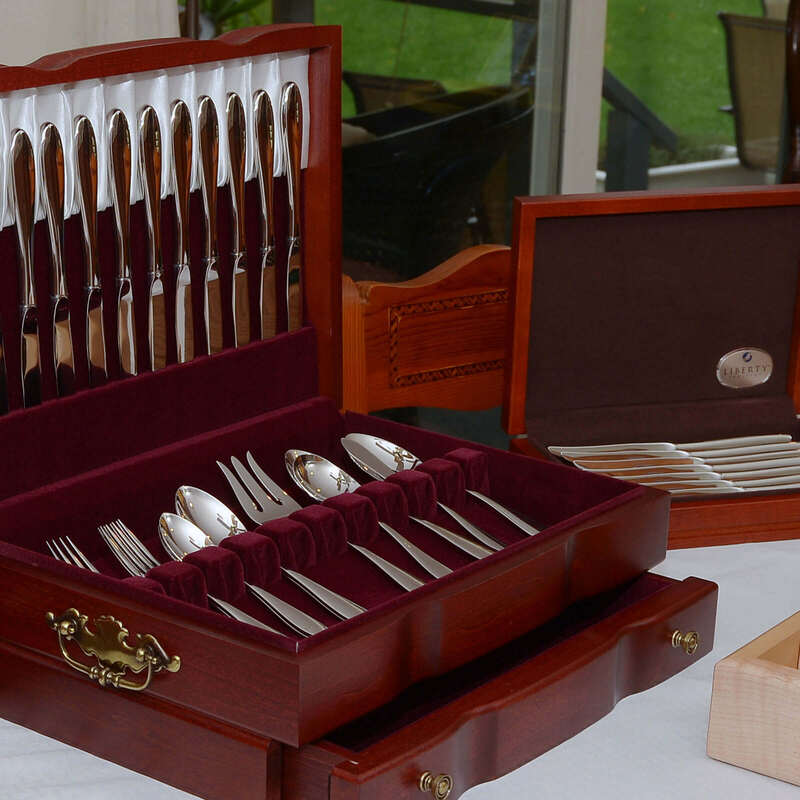 Top notch silverware at a decent price. 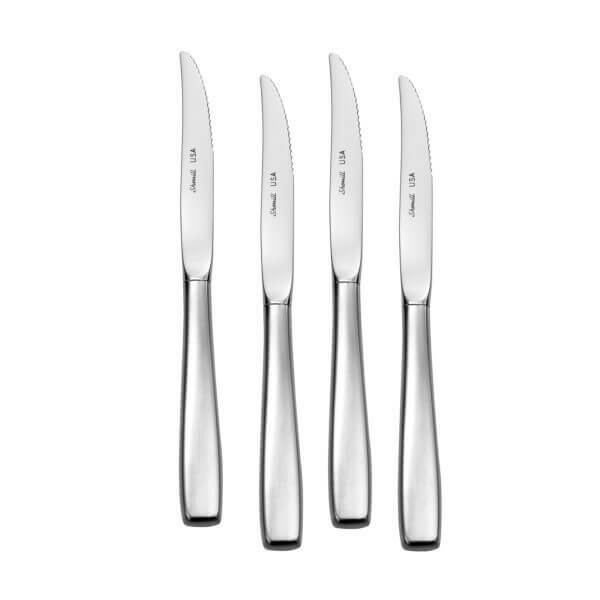 I wanted new flatware for my new home and this is perfect. It’s truly quality. I try my hardest to purchase “Made in America” products even if they cost a little more. However, I felt my Liberty service for 12 was an excellent price and more importantly – quality.